**UPDATE--Sweet Tuesday died on January 30th. She is healed now in heaven and in the arms of Jesus. Please pray for her family. I found this on the SITS site and wanted to pass it on. Prayers for Harper have been amazing and she is doing so well. Tuesday is a twin with cancer who has been sent home from the hospital to be with her family. Click on the link on the side to go to her site and flood them with prayers please. I know there are so many in need of prayers. 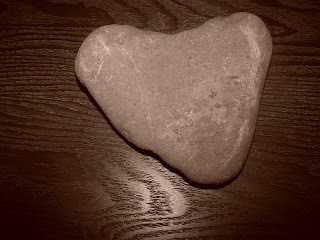 The children get to me, especially since our baby son died 8 years ago. Prayer changes things--don't be afraid to pray for miraculous healing, but also for peace and strength for the family. Thanks--and don't forget to hold those dear to a little closer and longer. I'm a day behind, sorry! Oh yes, one of my blogging resolutions was to not feel guilty about not posting, so it is okay I am a day late. 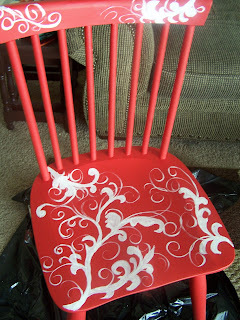 I had fun painting this chair. I've had it for awhile, I think I picked it up at a garage sale. It looked like it could have been old, but had been repaired and is cracked a little across the top so I am sure if I was on the Antique Road Show that would not have told me that I had ruined a priceless, 18th century heirloom (please tell me I didn't Ü). Anyways, I guessed I chose red because of the approaching Valentine's Day and I did the black over the white for something different. 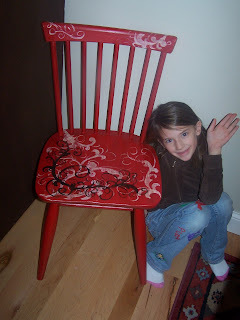 Daughter wanted to say hi, the chair was still sticky so she couldn't sit in it (see her cute jeans she painted). I received this great award from Jen at Sanctuary Arts. This means so much to me as her transformations are amazing! Whispering to furniture is a lot less tragic than whispering to horses. Speaking of transformations, I hope to show you one later tonight, or tomorrow, so stayed tuned. 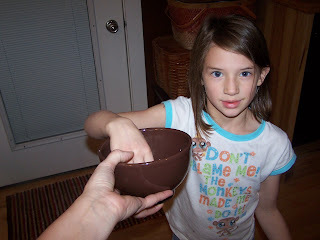 Also Jen is having a great give-away on her blog so hop on over there and enter to win! I pass this great award on to Screaming Meme. Look at what she has done to make a saloon bar. Or check out this great redo of a hutch. 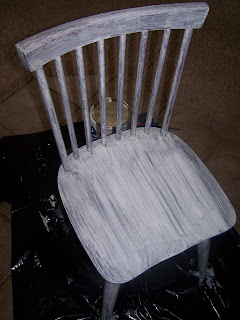 And don't forget to check out her 2008 posts for some wonderful tutorials on faux finishes. Thank you for the words of support and encouragement for my son and us. This drama too shall pass, thankfully, and it passes easier with God's help and your support! PS--I have this set to show links in red, but they only show up if you run your mouse over them. So be sure to link on over to Jen and Meme! Do not be afraid; do not be discouraged. It's been a trying weekend. And without going into details, let's just say teenage son made some bad choices and got caught, thankfully. I always pray that God will reveal what my children are doing. He is fine, extremely remorseful, and we are fine. When hubby called and told me, my heart sank (honestly, right into my bowels!). I went to my knees with my bible. I prayed several different verses for us, and this was one of them. Parenting sure teaches you a lot about how God feels about us, his children. I was very disappointed, but also proud that my son did fess up right away, apparently one of the few students who did. I am sure that is how God feels when we confess to him. I also hurt so badly for my son and wanted him to know how much he was loved, even though we were upset. It was very important to me that he understood how deeply I loved him, no matter what. Just imagine how much more our Father in heaven loves us with his perfect love. Please know, whether you are a believer or not, you are loved completely by God, no matter what. Happy Sunday! Junk of a different kind. 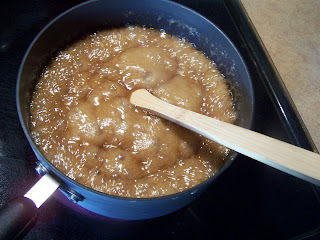 This is a little more fattening than thrift store junk, but it smells better too! 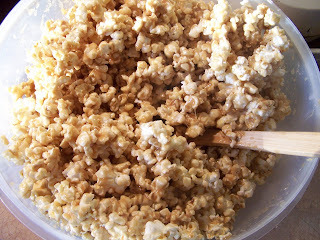 This is a yummy recipe for caramel corn that my family loves! Pop up 2 bags of light popcorn (light so it is not as buttery). 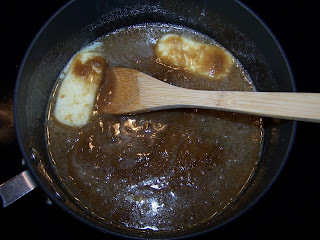 Bring butter, sugar and syrup to a boil. Boil, while stirring for 3-4 minutes. 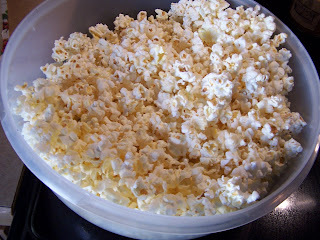 Remove from heat and add sweetened milk, stir and pour over popcorn and mix thoroughly. I was going to put it in a prettier bowl for the pictures, but hey, this is us, ugly tupperware and all Ü. Try some this weekend! I have been blessed in the past week week to receive some awards for some of my favorite bloggers. Isn't the blogging community sweet and wonderful and supportive! High school should be more like the blogging community. I received the lemonade award from Cindy at Tinta's Treasures and from Snowman Hill. 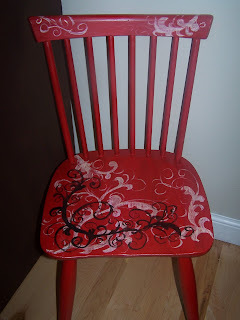 These girls are creative with the junk and thrifty decorating. Check them out please! Bloggers who show great attitude and gratitude. Upon receiving The Lemonade Award, you also pass it on to other bloggers who you think show great attitude and gratitude. 2. Nominate at least 5 blogs which show great Attitude and/or Gratitude! I also received this cool award from WhisperWood Cottage. She manages to find some of the coolest junk--stuff I never see around these parts! 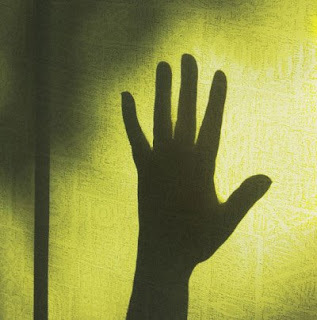 "This Blog invests and believes the Proximity- nearness in space, time and relationships! These blogs are exceedingly charming...these kind bloggers aim to find and be friends. They are not interested in prizes or self- aggrandizement. Our hope is that when the ribbons of these prizes are cut, even more friendships are propagated. Please give more attention to these writers!" 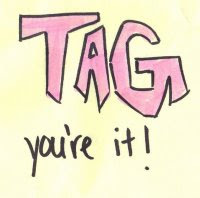 I was also tagged ( I loved tag as a kid--freeze tag and cartoon tag were my favorites!) by A Southern Rose (this name conjures up the most wonderful southern images). 1. Not sure if I shared this one before--I can't stand to sleep with socks on, even in the dead of winter, and I sleep with my feet sticking out of the covers. I say that I have to "breathe" through my feet. 2. I like to clean the oven and even though I have a self cleaning oven, I do it with easy-off. It is gratifying to see the results and doesn't smoke up the house. 3. I like peanut butter and pickles sandwiches on wheat bread-mmm. 4. I hated tomatoes until I craved them during my first pregnancy--now I love them. 5. I crave chocolate like crazy once a month (yes, during PMS), and it is not in my head like some male GYN would like to suggest! 6. I was a synchronized swimmer as a child. I was also on the swim team, but I only did that because they got to eat dry jello before a race and I wanted to eat dry jello powder too! 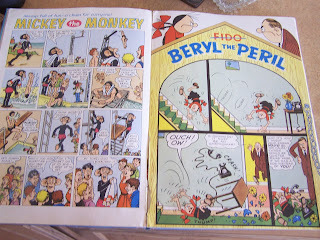 I tag Margo! 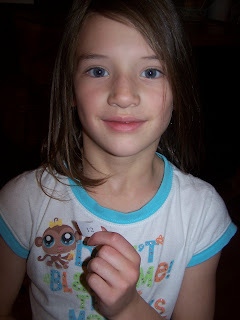 (I know she has already received some of the above awards--so she gets the tag!). There is also a tag going around to post your 4th picture in your 4th file. 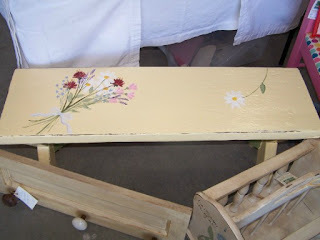 Here is mine--it is a furniture redo, a picnic bench painted with wildflowers. I tag all of you for the picture tag--it is fun, show us what you got! Happy end of the week--enjoy! Home--hopefully that word invokes a warm feeling in your heart and a smile on your face. I love being home and can be quite the homebody, especially in the winter months. 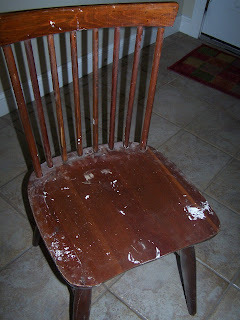 I suppose that is one reason decorating and changing and fixing up my home is so enjoyable to me--I just love the home. I have called a tiny married student housing apartment home, a 3000 square foot basement home (we were caretakers for an older lady), several strange and somewhat questionable apartments home, a 35 year old pink house (which we painted 4 days after moving in), and 2 new houses home. It's really not the size or the layout that matters, but the love and the family inside. I, of course, do "things" to make a place feel homey--personal pictures, yummy smelling candles, warm fuzzy blankets, using my favorite found objects. But, no matter where I live, love and attitude and a willingness to make a place our own makes a dwelling a home. 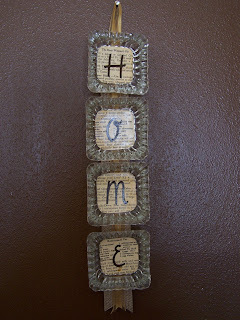 Share with us--what do you do to make a house a home? I used the glass candle trays I showed in my thrifting post to make this home hanging. I found this great cookbook, that was falling apart, for 25 cents at a garage sale. It was in pieces and the paper is very brittle, but someone had the good sense to keep it. 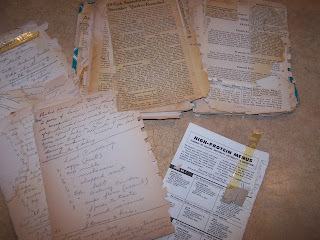 The original owner kept all kinds of notes in it, newspaper articles and several hand-written recipes. She dated when she made certain recipes. The dates start in 1940, right before the bombing of Pearl Harbor, and date all the way through 1959. Notice the high protein menus from way back then! I use the original pages when I make stuff with it--it is just too fragile to keep around for too long, and I like using originals. I cute the HOME letters out on my Cricket, but you could use letter stickers too. I hot glued the ribbon and burlap ribbon to the back. but also has put his hand on you for something special. The vintage decanters sell well. 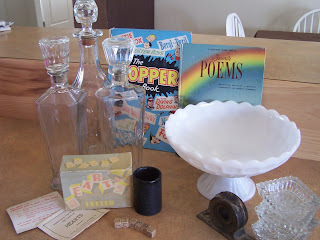 The little glass votive holders I will use for a project I have in mind, as well as the pulley thingy. 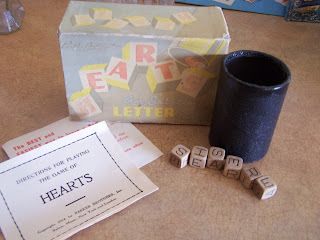 I love this hearts game with a 1914 copyright. 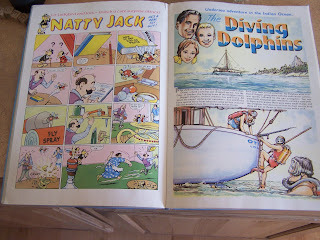 And this Topper Comic book from 1961--check out the graphics. Have a great weekend, we are heading out for a bball tourney, but will be back Sunday with a new verse. I made these quick projects awhile ago, but I can't find that I ever shared them, so here you go. They really are easy ones and are made with easy to find junk. 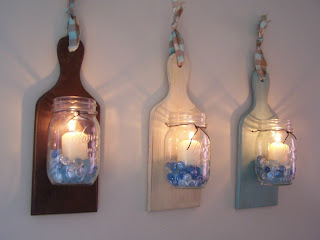 The first one is simple candle sconces ( I guess that are sconces--not sure of the official definition of sconce) made from some cutting boards I found at the thrift store. I painted them up, drilled holes for the wire and wired the bottles on. I used glass rocks in them and would be great for real candles, or those little flickering battery operated tealight ones. 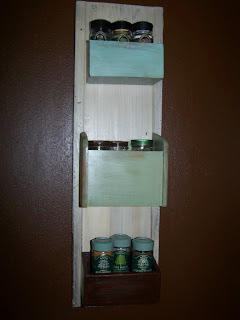 The other project is made from wooden recipe boxes which are always at the thrift store. I popped the lids off, painted them and screwed them into an old board. They are great catch-alls for spices, or could be used in an office for office "stuff". I did it--I think I have last week's verses down--the last two lines are still a little shaky. I used visual pictures to help me--me setting the table with a plate that said Lord on it or shaking my right hand--I am definitely a visual learner. 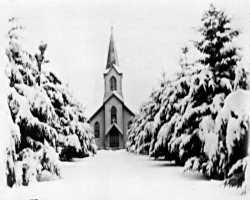 Here is a mini tutorial on Beth Moore's blog on memorization. I chose it because in these unstable times, knowing I can have a little stability is a good thing. Have a great day! I had the day planned--I worked out, worked on a little project, did my bible study, had just gotten dressed and was ready to head to town for some thrifting and the phone rang. It was the school secretary telling my my youngest had a tummy ache and a slight fever. I thought, "No! I was going to have a day to myself. I had my timetable worked out. I had cleaning and exercising and working (thrifting counts as working!) in there. " "I will be there in a few minutes," I replied with a sigh. So, I have an unexpected day at home with a semi-sick child on the couch (she seems to have a voracious appetite still!). I am trying to see the blessings in this--more time to clean, time to catch up on blogging, I am gratefulto be able to be home with my daughter. but darn it anyhow, those thrift stores were calling my name! I did make this little project this morning. I saw it in a magazine--I can't remember which one. I found a wood silverware organizer at the thrift store for a buck. I think it was fairly old and had dovetail corners. I painted it blue and brown, decoupaged some fabric in the back and added some hooks for a jewelry display. 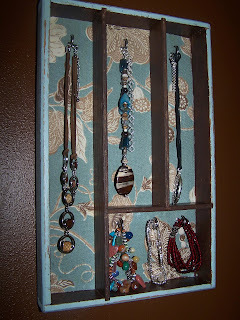 Simple and a great way to display and organize jewelry. The Inspired Room is having a Beautiful Life linky hook-up thingy. She is planning on doing this every Friday. It's a good chance to reflect and think about the things that I am doing to make my life more beautiful and hopefully those people whose lives I touch more beautiful. My scripture memorization is going well. How does this make my life more beautiful? Knowing God's Word and writing it on my hearet and being able to pray it for myself and others is powerful and wonderful. I have been organizing and cleaning--we took two loads to the dump-yippee! I have been either trying to spend 10-5 minutes a day organizing something or I grab 10 things (or more) at a time to donate. I have been exercising every day which gives me more energy and just a better outlook in general. And I am trying to put a positive spin on every day ordinary things, like a day at home with a sick child. Have a good Friday! I don't know if this wardrobe will take you to any magical lands like Narnia, but I do think that it is a pretty special piece. What makes it even more wonderful is that was given to me by a friend of a friend--free. It has a history too--it is from an old Montana ranch and homestead. It needs a little repair--the door trim is inside of it. So I will fix 'er up and take it to my antique booth. I am starting the newest Beth Moore study tonight--Esther. I am excited, Beth always brings God's Word to life and relevance for me. I have my verse half memorized--I am working it one line at a time. Thanks for your comments and support. PS--Can you see that my hubby is working on getting my basement finished?--yippee! I guess I am going to be a copycat because I know that many of you already do this, but this year I would like to share with you a verse each Sunday that I am working on memorizing. Memorization--there is something that goes downhill with age ( along with the chest!). I used to be able to memorize all sorts of things, the periodic table, entire psalms, useless math equations (yes honey, I said useless--hubby is a math teacher). But, I am really going to make scripture memorization a priority this year. Maybe if I knew I was going to get some reward, a patch or an ice cream certificate, it would help. I'll have to think about that. I am not starting with a short one, but a few verses that speak a lot to me. my body also will rest secure. I have been moving slowly into this resolution thing this year. I am still in vacation mode. But, since school starts Monday, I did decide I needed to start thinking about the new year and the new changes I want in my life. I am still working on the personal ones, and I will share some of those later, but I have come up with a few blogging resolutions. I have so enjoyed blogging since I started in the spring and hope to do more of it in 2009. 1. Post at least 3 times a week (this is a minimum). 2. Post more tutorials, especially using junk that is easy to find. 3. Share God's Word through verses I am memorizing and share more about how God is working in my life. 4. Show more pictures of my house--the good, the bad, and the ugly! 5. Not show too many pictures of my children. 6. Support other bloggers not only by commenting on their blogs, but by linking to them. 7. Not feel guilty if I don't post. Okay--I think that is plenty to get me started. And because I can't stand to post without a picture, I thought I'd show this project that will hopefully be happening soon. 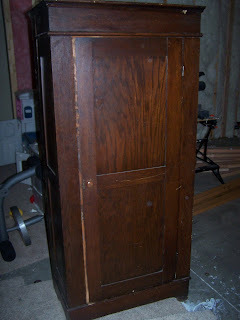 This is the top of the brown cabinet (see here). 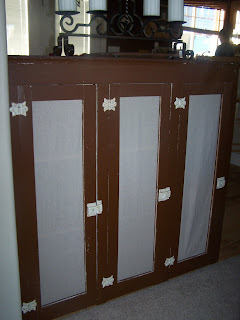 I have had it for a few years as a divider in my dining room (or eat-in kitchen--no formal dining room). It's always bugged me a bit--been a bit too big. 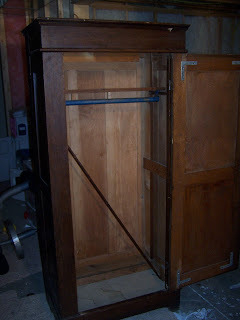 I took the top off and turned it around, added fabric to the doors and now store games and cookbooks in there. I am going to add onto it and make an L shaped bench on the other side, half the L attached to the cabinet, half along the wall. We want a longer table, that can seat 3 on one side and 8 total. I will be making the table too, as this is in my budget. For now, I am happy with the half cabinet. Thanks for all of the great comments. 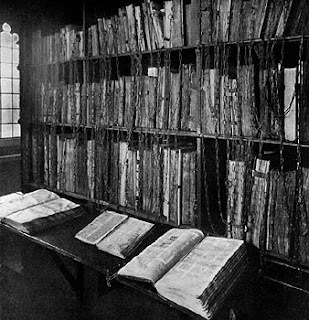 There are so many from new readers. I look forward to going to your blogs and checking them out. I took the comments from the last posts, plus the original one about the give away, deleted any duplicates, numbered them, printed out numbers and my lovely assistant drew number 12 who is Sarah at Thrifty Decor Chick. 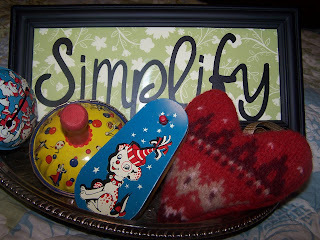 Here are the goodies you can win: a lavender filled heart that I made from a felted wool sweater, a simplify sign, and 3 vintage noisemakers. Leave a comment on the 100th post by Friday at 6 pm MST to be entered to win. Good luck!